I cooked up a big Italian feast for my good friend Mark Thompson‘s birthday party the other week and I decided to share some recipes with you guys 🙂 First up is this cucumber carpaccio. I was originally thinking I’d make my zucchini carpaccio, but since Mark is not a big fan of zucchini we switched it up a bit to cucumbers. This dish is super tasty and is fabulous as a salad, appetizer or even something to nibble on while watching the upcoming games and award shows. Place the onions and vinegar in a sealable container with a big pinch of salt and refrigerate overnight or for a few hours. 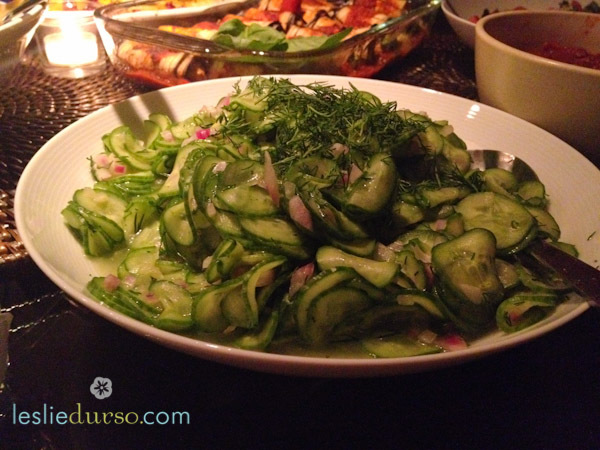 Toss the cucumbers and dill in the onions and vinegar. Season to taste with the salt and pepper and finish by drizzling the olive oil over. Looks like the event was a success!